A Silver Lining: The cutest hospital gowns I have ever seen! 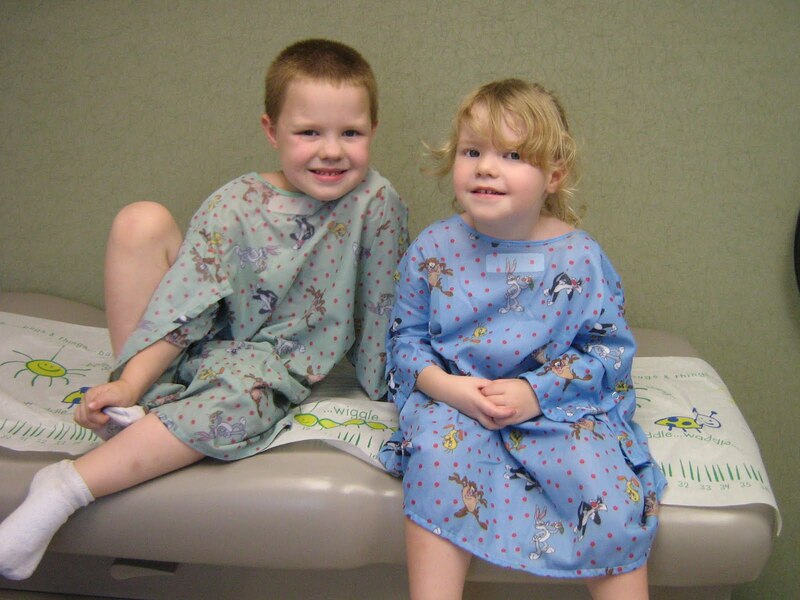 The cutest hospital gowns I have ever seen! We had to get two school physicals this year! They were all smiles before the shots... (Oh did I just say that awful word that strikes fear into the heart of all children?) Yes I did, and let me tell you that day shot fear into my heart as well. I don't know how I managed to hold Haily screaming to the top of her longs while trying to pull Quinten out from under a chair while he has a death grip on the legs of the chair. The whole time Quinten is screaming "I DON'T WANT SHOTS I DON'T WANT SHOTS I DON'T WANT SHOTS!!!!" Whew that was a fun one, wish I had taken an after picture!